Domino’s is now testing delivering pizza using drones. The pizza chain conducted its first drone delivery in Auckland late last week and plans to begin testing drone delivery to New Zealand homes by the end of 2016. Chief Executive Officer of Domino’s, Don Meij, said the company’s growth over the past few years has forced Domino’s to consider alternative delivery methods. “Domino’s is all about providing customers with choice and making customer’s lives easier,” said Meji. 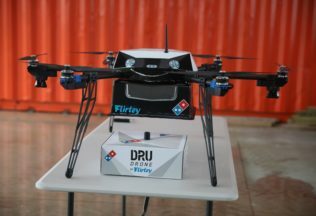 “Adding innovation such as drone deliveries means customers can experience cutting-edge technology and the convenience of having their Supreme pizza delivered via air to their door,” he said. Earlier in August 2016, Domino’s announced a record profit for its 2016 financial year, largely attributing its success to its investment in innovative technology. “We’ve always said that it doesn’t make sense to have a 2-tonne machine delivering a 2-kilogram order,” said Meji. As the trial progresses, Domino’s said it will increase the dimension, weight and distance of the drone deliveries. Domino’s said it is looking at opportunities for drone delivery trials in Australia, Belgium, France, The Netherlands, Japan and Germany. Has the supermarket of the future just arrived?